Mercedes-Benz dealer Hap Seng Star had a memorable night at the Mercedes-Benz Dealer Awards 2018 that took place at the Renaissance Hotel in Johor Bahru on March 7. Hap Seng Star won big at the gala dinner event, its dealerships taking home not just the top prize in many of the categories but also most of the first and second runner-up titles as well. 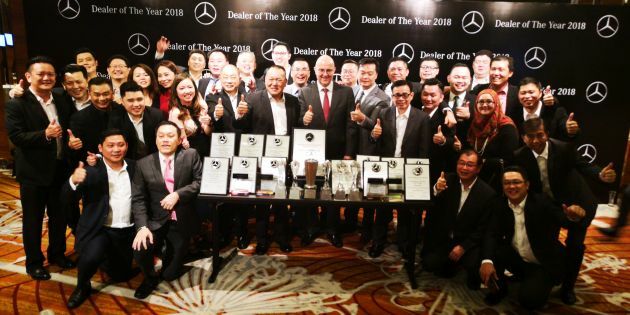 The most coveted award was that of Dealer of the Year 2018, and Hap Seng Star Kota Kinabalu bagged the title of the top Mercedes-Benz dealership in the country, with Hap Seng Star Bukit Tinggi being placed first runner-up and Hap Seng Star Kinrara second runner-up in the category. The Best in Sales 2018 award saw Hap Seng Star Bukit Tinggi emerge as champion, with Hap Seng Star Jalan Ipoh (first runner-up) and Hap Seng Star Balakong (second runner-up) making it a top three finish for Hap Seng Star. The Best in CSI & CLI 2018 award was won by Hap Seng Star Kota Kinabalu, ahead of Hap Seng Star Bukit Tinggi and Hap Seng Star Kuching, the first and second runner-ups respectively. It was another top three sweep for the company in the CLI – Loyalty First award. Hap Seng Star Kota Kinabalu took home the top award, while Hap Seng Star Kuching and Hap Seng Star Kinrara were named first and second runner-up. For the CSI No.1 (Sales) – Delightful Customer Care award, Hap Seng Star Iskandar was named as the champion, with Hap Seng Star Balakong taking the first runner-up spot in the category. The company also took home the Best in Customer Service 2018 award through Hap Seng Star Balakong, with Hap Seng Star Kinrara finishing as first runner-up. Completing the huge win for Hap Seng Star on the night were the top awards for Best in Business Excellence 2018, won by Hap Seng Star Kota Kinabalu, and Best in Financial Services 2018, which saw Hap Seng Star Bukit Tinggi being named champion. Next Post: Nissan to debut new sedan in Shanghai – new Sylphy?